Vertreibung und die widerrechtliche Aneignung von Land, häufig begleitet von Gewalt und Einschüchterung, bilden seit jeher ein Kernmerkmal von Kolumbiens internem bewaffneten Konflikt. Getroffen haben diese Menschenrechtsverletzungen und –verstöße vor allem indigene, afrokolumbianische und Kleinbauern-Gemeinden. 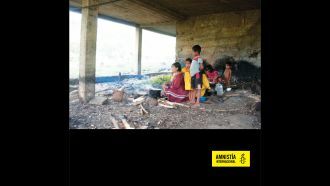 The Colombian government must prioritize the right of Indigenous and Afro-descendant communities to decide how their land is developed above companies’ desire to exploit those territories for profit, said Amnesty International in a new report today. Access to and use of Colombia’s resource-rich land is one of the most critical issues in the peace negotiations between the government and the guerrilla group Revolutionary Armed Forces of Colombia (FARC), currently taking place in Havana, Cuba. Many of those who have been forced off their homes due to the armed conflict are looking for ways to return to and reclaim their lands. “The ownership and occupation of land has been at the heart of Colombia’s brutal war, with around six million forced off their homes since 1985 because of the violence. Any peace deal will be meaningless unless the rights of Indigenous and Afro-descendant communities to return to their lands and decide how they are used are prioritized above companies’ desire to exploit those lands for their own profit,” said Erika Guevara Rosas, Americas Director at Amnesty International. Any peace deal will be meaningless unless the rights of Indigenous and Afro-descendant communities to return to their lands and decide how they are used are prioritized above companies’ desire to exploit those lands for their own profit. Some six million people have been forcibly displaced from their homes as a result of Colombia’s armed conflict. At least eight million hectares of land — some 14% of the country’s territory – have been abandoned or illegally acquired. Most of those affected are Indigenous, Afro-descendant and peasant farmer communities whose existence depends on living off their land. Many of these communities have been repeatedly forced off their lands after years of threats and killings carried out by the security forces, paramilitaries often acting in collusion with the military, and guerrilla forces. Displacement often takes place in areas with potential for economic exploitation, including mining. Over the years, the Colombian authorities have granted licenses to mining and other companies looking to exploit these lands and their vast natural resources, and in the case of the territories of Indigenous and Afro-descendant communities they have often done so without properly consulting with them and obtaining their free, prior and informed consent. In 2012, the government began a land restitution and reparation programme for some of the victims of the armed conflict. The process marked a significant step forward in efforts to address the issue of victims’ rights, but it has moved far too slowly and has been poorly implemented. Relatively few of those claiming their lands back have been able to return or gain legal ownership over them, while the authorities have failed to ensure effective support for those who have been able to return. In addition, legislation introduced by the government could actually make it more difficult for those forced off their land to gain legal ownership and effective control. For example, Law 1753, approved by Congress in June 2015, could make it easier for companies to set up operations on misappropriated lands or lands over which control has been secured through human rights violations and abuses, including on territories collectively owned by Indigenous People and Afro-descendant communities. Since 2008, the Colombian authorities have registered mining applications and granted mining titles to multinational companies on more than 60% of the territory of the Alto Andágueda Indigenous community, in the north-western department of Chocó, which puts the very existence of the community at risk. However, in September 2014, Alto Andágueda became the subject of the first judicial sentence for the restitution of Indigenous territory. For Indigenous People, Afro-descendants and peasant farmers, access to land is not a whim, but is an intrinsic part of their identity and existence as communities. The ruling gave hope to the thousands of people who had been forced to flee violence by the security forces, paramilitaries and guerrilla groups fighting for control of the resource-rich area. However, the authorities have failed to implement many of the measures ordered by the restitution judges to ensure the community can sustain itself on its territory. “For Indigenous People, Afro-descendants and peasant farmers, access to land is not a whim, but is an intrinsic part of their identity and existence as communities. By failing to effectively support the sustainable return of these communities, the Colombian authorities are simply sentencing thousands to poverty and continued human rights violations and abuses,” said Erika Guevara Rosas. 260,000 – the number of people, mostly civilians, who have been killed since the armed conflict began in the 1960s. Tens of thousands have been abducted or forcibly disappeared since then. . Some six million – the number of people who have been forcibly displaced. At least 1.4 million – the number of Indigenous people in Colombia. More than 70% live in rural areas. Almost half a million – the number of Indigenous people who do not have official recognition of their collective land rights. Between four and ten million – the number of people in Colombia who self-identify as afro-descendants. ← Monatsbericht: Fährt FARC-Kommandant Timochenko bald mit dem Velo zum Fischen?